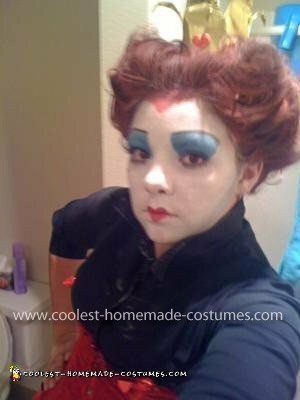 I love dressing up for Halloween and I love Alice in Wonderland, so I chose the Red Queen as my 2010 Halloween project. I did my own hair and makeup. Yes, that is my own hair. I made my crown out of a little gold gift bag for just $1 and glued heart buttons all around it. I used bread ties to curl the pointy tips of the crown outward. I made the skirt my self and bought a deep red courset online to go with it. My sis inlaw likes Johnny Depp and wanted to be the Mad Hatter. She did her own hair and makeup as well, and yes that is her real hair too. So we grabbed her classiest vest, caprese and boots, went to a thrifty store and bought the goofiest purple shirt and green leggings. 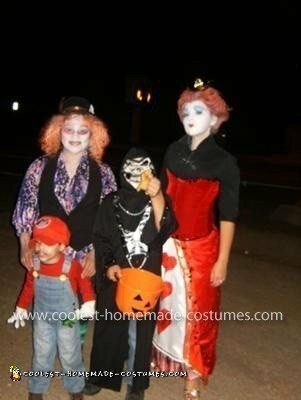 We colored the green leggings, bought a top hat went to the craft store and purchased some orange/translucent ribbon, burned a 10/6 sign and here you have it, our Homemade Red Queen and Mad Hatter Costume.